As the candy rush fades, the Halloween hacks continue pouring in. 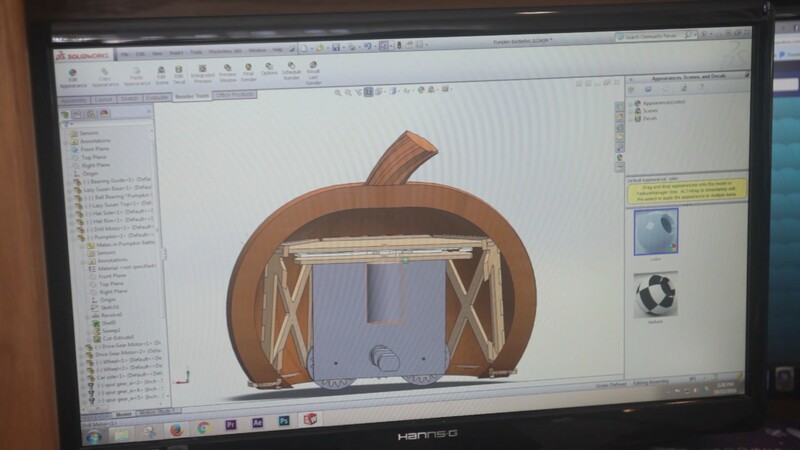 [Jeremy S Cook] has taken a few fundamental concepts and dressed them up inside the smartest pumpkin on the block. This pumpkin has a WEMOS D1 Mini ESP8266 brain, LED eyes in place of a candle for illumination, and a small USB power bank for power. The code [Cook] is using is a modified sketch by YouTuber [Innovative Tom], which creates a server on your network — don’t forget to insert your network credentials! — that enable control of the LEDs from your computer or smart phone. [Cook] has wired the LEDs to the relevant pins on the D1 Mini, zip-tied the battery and board together and stuff them in a plastic bag to keep them dry. Stick that into the pumpkin, hot glue the LEDs in place, and test it out! Fall – it’s that time of year that brings falling leaves, Hallowe’en, and a pumpkin version of everything that you hold dear. In this case, it’s not a latte – it’s [Robert Vorthman]’s Pumpkin Piano. [Robert] took a straightforward approach to the build, pressing a Raspberry Pi into service as the backbone of the operation. This is combined with an Adafruit breakout board for the MPR121, which is a chip that provides 12 capacitive touch-sensitive inputs. These are connected to the bountiful produce which make up the piano keys in this fun holiday hack. [Robert] uses some Python code that talks to fluidsynth, a software synthesizer that uses Soundfont files to create different sounds. It’s all wrapped up with some Neopixels that flash when each vegetable is triggered. The build would make a great party piece for just about any fall gathering, and [Robert] has done a great job of rolling up all the hardware and software required in the write-up. For another take on a vegetable-based orchestra, check out last year’s Harpsi-gourd. Halloween might be over, but for some of us there’s still another pumpkin-centric holiday right around the corner to give us an excuse to build projects out of various gourds. During a challenge at a local event, [Michael] came up with a virtual cornucopia of uses for all of the squashes he had on hand and built a touch-sensitive piano with all of them. The musical instrument was dubbed the Harpsi-Gourd and makes extensive use of the Arduino touch-sensitive libraries. Beyond that, the project was constructed to be able to fit into a standard sized upright piano. While only 15 pumpkins are currently employed, the instrument can be scaled up to 48 pumpkins. Presumably they would need to be very small for the lid of the piano to still close. The Harpsi-Gourd is a whimsical re-imagining of the original Makey Makey which can be used to do all kinds of things, including play Mario Bros. There are all kinds of other food-based musical instruments at your disposal as well, though. It’s that time of year again. The nights are getting longer and the leaves are turning. The crisp fall air makes one’s thoughts turn to BattleBots: pumpkin-skinned BattleBots. The footage of the pumpkinbot’s rival, Chomp, is equally cool. We love that the hammer weapon is accelerated so quickly that Chomp actually lifts in the air, just as Newton would have predicted. We’re not sure if the fire weapon is good for anything but show, and facing plywood pumpkinbots, but we love the effect. Everyone has an episode somewhere in their youth involving the use of an aerosol spray as an impromptu flamethrower. Take some mildly inebriated teenagers, given them a deodorant can and a box of matches, and sooner or later one or two of them are going to lose their eyebrows. For most of us an amusing teenage episode is how the aerosol flamethrower remains. Not for [Mike Waddick] though, when last week’s DDoS attack on DNS infrastructure took away his ability to work his, attention turned to a Halloween project. He created a carved pumpkin that spits fire as a notification signal when a text or an email is received. Key to the project is the Glade Automatic Spray Air Freshener. This is a battery-powered device with an aerosol can that is operated by either an electronic timer or a push-button switch. Remove the switch, and its line is revealed as an active low trigger for the spray. [Mike] replaced the switch with a line from a microcontroller and put a lit tea-light candle in front of the nozzle for fully controllable (if not entirely safe) flamethrower fun. Early tests proved the concept, so it only remained for the pumpkin to be carved and the system installed. The microcontroller used in this case was the Lightblue Bean, though almost any similar board could have been put in its place. Notifications were processed via Bluetooth from an iPhone via ANCS (Apple Notification Center Service), which the Bean could query to trigger its fiery alerts. There is a brief video showing the device in action singeing [Mike]’s hand, which we’ve placed below the break. Planning to make that carved a pumpkin last past Halloween night? Forget the tealight or LED candle—here’s an easy, no-solder project that will make it extra special. By default, this jack-o-lantern looks like it has a flickering flame, but get close enough to it and it goes crazy with color. All you need is an LED matrix, a Rainbowduino to drive it, a PIR motion sensor to trigger the random colors, and a power source. [Alpha Charlie] kept the electronics from becoming pumpkin-flavored with some plastic bags. Since he used the PIR as the jack-o-lantern’s nose, there is a bit of plastic behind it to keep moisture from interfering. [Alpha Charlie]’s build instructions are quite detailed, which makes this project even simpler if you’ve never used a PIR before. There are lots of ways you could build on this project to make it your own, like using trick-or-treater motion to trigger screams or spooky sounds, or add more sensors to make it more interactive. Watch it react after the break. If you have nothing else at all to do between now and trick-or-treat time, you could bust out the soldering iron and recreate this 70-LED matrix jack-o-lantern. Blinkenlights too safe for your tastes? Fire-breather it is, then.